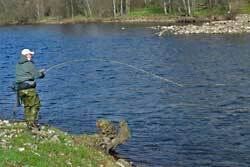 Spey casting instruction and great salmon fishing. Spey casting, Double Spey casting, Snap Tees and Snake Rolls all learned in two days! 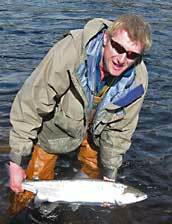 Fly casting students enjoyed a successful salmon fishing school during April an Pitlochry. Using both double handed fly rods and single handed fly rods everyone was taught the theory and practice of efficient Roll and Spey casting and the school was described as "a great weekend" by all concerned. From my point of view as the chief instructor it was a privilege to teach such a varied and skilled group of people some of whom had traveled thousands of miles to learn Spey casting in the traditional and efficient Scottish style. The last day was optional, an opportunity to fish with expert tuition by Ally Gowans and Dr Andy Gowans. 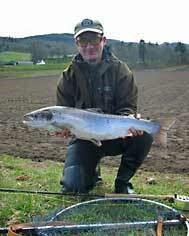 Six anglers fished and caught three lovely spring salmon using their newly gained knowledge and fly casting skills. Sink tip fly lines and Willie Gunn fly was the successful combination on the day. The fish were all around the 12 lb mark and two of them were gleaming bright, fresh run salmon. Richard Heslop tied his own Willie Gunn fly, learnt to cast and fished like an expert for his first Atlantic Salmon, on his birthday. His comments "
"Thanks very much for a truly enjoyable weekend. The hotel and company in the evenings was 1st class and catching my first salmon just before home time on Monday was the icing on the cake. I managed to get some time on the river last week and, although I didn’t see any fish thanks to Ally my casting has improved dramatically". Donagh McCarthy more used to Irish salmon landed his first Scottish salmon after a tough battle which involved wrapping the line around a tree branch but in the end the fish was safely landed and released! And Andy Gowans superb teacher that he is had to catch a fish to prevent the instructors being outshone by the students! If you wish to easily learn how to fly fish for salmon see the list of Spey casting and salmon fishing schools "Spey Casting Made Easy" available on the Home Page. Suitable equipment is available if you need it so there is no need to rush out and buy rods, reels and lines before the course if you prefer. If not the recommended tackle for summer on the Tay is a 14 or 15 ft fly rod, floating, multi-tip, sink tip or intermediate fly lines and a selection of flies including tubes to 1 inch and dressed hooks size #6, #8 and #10 favourite patterns include Tummel Shrimp, Cascade and Ally's Shrimp. During springtime a 15 or 16 ft rod with a sinking line or shooting head outfit and some larger sizes of tube flies such as Willie Gunn, Black & Yellow and Garry Dog are recommended. Places on the school are limited and early booking is advised to avoid disappointment. NEW! Spey Casting Made Easy DVD by Ally Gowans - learn the essentials of efficient Spey casting.